Kristin Omdahl is passionate about creating with her hands. She loves coastal, tropical living and having fun outside with her son every day. 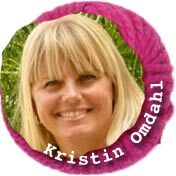 Kristin is the author of Wrapped In Crochet, Crochet So Fine, A Knitting Wrapsody, Seamless Crochet, and the crochet expert on “Knitting Daily TV” and several DVD workshops. Check out what's new with Kristin at www.StyledbyKristin.com. Click on photos to download instructions. Row 5 – 20: cont in east patt until 3 sts rem. Row 21 (last row): Ch1, sc3tog-tbl. Do not fasten off. Rows 2 – 21: rep rwos 2 - 21 of square 1. Row 2 – 22: rep rows 2 - 22 of square 1. Rows 2 – 22: rep rows 2 - 22 of square 1. Make squares 1– 9 once more. Holding both 3x3 squares together, work 1 round of (slst, ch1) around 3 sides. Insert pillow form inside pillow case and continue to complete round of (slst, ch1) aorund. Slst to first st to join. Fasten off. 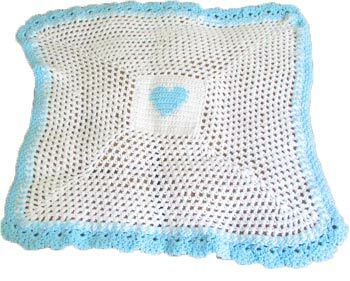 I designed this blanket for my son when he was a baby, out of necessity because I didn't have access to patterns. 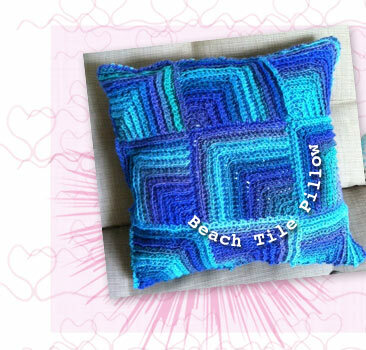 While it was a challenge back then, it became a blessing because without the need for creating patterns, perhaps my career in the craft industry would not have been born. When I was asked to participate in this wonderful project, the "I Love Yarn" Day, I couldn't think of a more appropriate project to contribute than one of my original designs I created for my baby boy when he and I were alone in a foreign land and wishing for the day we could safely return to our own country. 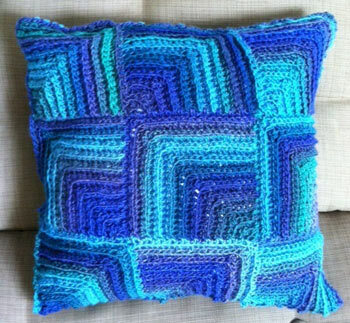 I was a true beginner when I created this blanket, and therefore I can assure you the pattern is skill level easy! 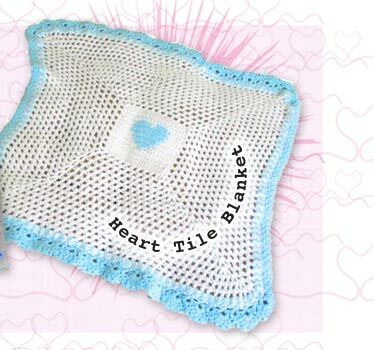 However, in writing the pattern, I have made a few modifications based on my current knowledge of crocheting and pattern writing, meaning yours will lay flatter because you will have proper increases in the corners (and your color separation will be crisper in the heart motif). Red Heart Super Saver Chunky (in 2 colors). The light (or white color) is color A, and the accent color (darker color) is color B. 3 balls main color, 1 (partial ball) contrast color. Row 2–5: ch1, sc in ea st across. Row 18–19: rep row 17. Note: remainder of blanket is worked in the round. Round 21: sl st into 2nd of 3sc in corner, ch4 (counts as dc, ch1), work (dc, ch1, dc) in same st. (ch1, skip 1 st, dc in next st)x9, *ch1, skip 1 st, (dc, ch1, dc, ch1, dc) in next st, (ch1, skip 1 st, dc in next st)x9. Rep from * 2 more times. Ch1, sl st to top of ch3 at beg of round to join. Round 22: Sl st in next ch1 sp dc, ch4 (counts as dc, ch1), work (dc, ch1, dc) in same st, (ch1, dc in next ch1 sp)x11, *ch1, (dc, ch1, dc, ch1, dc) in next dc), (ch1, dc in next ch1 sp)x11. Rep from * 2 more times. Ch1, sl st to top of ch3 at beg of round to join. Round 23 – 38: rep round 23, except work 2 more repeats in ea side of square per round. Note: next round is worked with both colors A and B, alternating every other stitch in ea color. Note: you will finish the last step of ea st with the opposite color. Round 39: with color A, sl st into next ch1 sp, ch3 (counts as dc), with color B, sl st in same ch1 sp, ch3 (counts as dc). *In next ch1 sp, work 1dc in color A, 1dc in color B. Rep from * around. Sl st to ch3 at beg of round with color A and fasten off. Sl st to ch3 sp at beg of round with color B but do not fasten off. Note: remainder of blanket is worked in color B only for edging. 2 sides are worked in a scallop and 2 sides are worked in seed stitch. If you prefer you could use one of these edgings for the entire perimeter. Round 40: ch8 (counts as dc, ch5), dc in same st. *Skip 2 sts, (dc, ch5, dc) in next st. Rep from * 29 more times. (ch1, skip 1 st, sc in next st)x39, ch1. Rep from * once more. Join with sl st to top of ch3 at beg of round. Round 41: slst into ch5 sp, ch3 (counts as dc), work 4 more dc in same sp, *(ch1, sc in next ch5 sp, ch1, 5dc in next ch5 sp)x13, (ch1, skip next sc, sc in next ch1 sp)x38*, 5dc in next ch5 sp. Rep from * to * once more. Slst to ch3 at beg of round to join. Round 42: ch1, *(sc in dc, (ch3, sc in next st)x4, skip sc)x15, (skip next sc, sc in next ch1 sp, ch1)x38, skip next sc, ch1. Rep from * once more. Sl st to first st at beg of round to join. Fasten off.